How To Eat Right When You’re At A Fast Food Restaurant - Something New Everyday! There comes a time in almost every diet plan where you find yourself sitting in a fast food establishment – or, as the case may be, frantically going through the drive-thru as you rush off to whatever else your day may bring. As you do this, anxiety starts to build in your stomach. You've been doing so well on your diet and now you are about to ruin it in one fell swoop. It's no secret that most fast food menu items are loaded with fat, refined carbs, and calories, and are the opposite of what a healthy diet should be. That said, if you are willing to put in a little extra effort, you can uncover hidden nutritional gems in a fast food restaurant that won't cause too much damage to your diet plan. Always remember, eating light when dining out is essential. You're far better off going for a light meal now and then simply adding more to your next meal – which you can prepare yourself – to make up for it. Let's look at how to eat right when dining fast food at a few different types of establishments. Perhaps the most commonly frequented fast food restaurants are burger joints. Be it McDonald's, Harvey's, Burger King or otherwise, one thing is certain and that is there is no shortage of high calorie options. Most burgers easily come in at 500+ calories and if you plan to add a side of fries to that, tack on another 600 or more. This makes for a meal that, for many people, is well over half of your daily food intake. The solution? Get smart. Most burger restaurants will have a grilled chicken burger option, so start there. Order your grilled chicken and then request it with no mayonnaise or 'special sauce' (Hint: Never trust the 'special sauce'). If you're on a low carb diet, you might consider removing half the bun from this sandwich, or forgoing the bread altogether and getting that chicken on top of a salad (if they don't have a chicken salad option in the first place). If you feel like you need something that contains potato, avoid French fries at all costs. There's simply no way to make these healthier. Instead, opt for a baked potato (if they have one) and top it with some salsa rather than traditional high fat source cream or butter. If you opt for these choices, you'll be eating wisely. Moving on, you might find yourself stopping at a taco or burrito place. While a bit less common than a burger place, these definitely have no shortage of locations as well. Here, the first tip is to opt for one type of 'shell' only. Don't do a soft shell in a hard shell. That's just double the calories, double the carbs, and double the fats. If you can, choose a softer shell. Hard shells have been fried and so, have more unwanted fats. Next, opt for grilled chicken over beef or steak for your meat filling or, if you prefer, try some beans instead. Beans are a much lower fat option and will give you a good dose of fiber as well. As you top that taco or burrito, keep the sour cream off. It's high in saturated fat and provides no real nutrition. Instead, try guacamole if it's offered. Request them to only put on a little, but feel good since it's a healthier form of fat that your body needs. Finally, be sure that you only eat one. Don't go in for two or more, even if the price seems right. One is more than enough to fuel you until you can get to a healthier meal. The next place you might find yourself stopping is the pizza house. The smell of freshly baked pizza is like none other, and you may be tempted to pick up the most delicious looking slice you can find. Instead, try and seek out a thin crust pizza. This alone can save you at least a hundred calories per slice, if not more. The thinner the base, the better. Then, watch your toppings. Try choosing the vegetarian pizza which will be lower in fat and calories than beef or pepperoni. And, the more vegetables on your slice, the better. Apart from these choices, you won't be able to alter much else on your pizza as in the fast food restaurant, it'll already be prepared and waiting for you. If you find yourself in a sit-down pizza house, then you can request that they use much less cheese, which will reduce the fat and sodium content. The coffee shop is another place you may frequent. Whether it's first thing in the morning or a quick stop-off as you go about your day, cafés and coffee shops are often our most convenient option when hunger strikes. So, what will you order? First, steer clear of anything baked or deep fried. Donuts, muffins, croissants – all bad news as far as your diet is concerned. Also, ditch the bagels. Bagels are simply too high in carbohydrates to be considered a 'light' meal option. Unless you have an intense workout planned for later in the day, you just don't need that many carbs. Going in for a freshly prepared sandwich can be one option here and from there, you might consider only eating half of it at once. Choose one that comes on wholegrain bread and is light on mayonnaise to keep the fat content down. Turkey and chicken are both great sandwich options, but do steer clear of tuna or egg salad. These are also going to be prepared with plenty of high fat mayonnaise, so won't do your diet proud. As an alternative option to a sandwich, you might go in for a broth-based soup. These are often served at coffee shops and can be a great way to fill that hunger void for the time being. Be it chicken noodle, vegetable or minestrone soup, all will provide just a few hundred calories. Finally, a word must be mentioned about your coffee selection. If you are getting a drink, make it as simple as possible. Many of the gourmet coffee varieties today are nothing short of dessert in a cup and will pack in far too many calories, along with grams of sugar and fat. Opt for a plain black coffee and add a little cinnamon and sweetner to it as desired. Herbal or green teas are also fantastic options. Being smart about how you hydrate is just as important as choosing the right foods to eat. 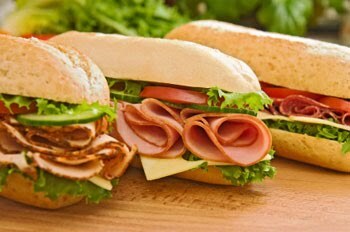 Sub sandwich's pride themselves on being the healthier alternative to the burger and in most cases they are. You do, however, still need to be careful about how you order. First, don't go in for that foot-long sub. A half sub (typically a 6 inch) is more than enough for just about everyone. Next, choose whole wheat bread. You will be taking in quite a bit of carbs at this meal, so the least you can do is make sure that it is going to provide some fiber as well. Next, opt for some lean meats – chicken breast, turkey are all quite good options. Steer clear of meatball subs, steak and cheese subs, or any sort of mayo based salad sub. Those will all contain too many fat and calories to be considered healthy. When choosing condiments, stick to mustard. It's your best bet to keep the calorie intake down and ensure that you aren't taking in any unwanted saturated fat. Load that sub up with as many fresh vegetables as possible. One great thing about a sub restaurant is that they typically make it right in front of you, so you can easily request more vegetables than average. So there you have some quick tips to remember as you find yourself in a fast food restaurant. There's no question that it's not the most ideal situation to be in if healthy eating is important to you, but this said, it doesn't need to completely derail your diet and lead to weight gain. You just need to be smart in your approach and practice moderation in serving size with whatever you choose to eat.